Here we are using Circle as parameter as Circle was used while creating the service. As discussed in the previous post, while resolving the dependencies injector comes into picture and as here there there are two parameters passed $scope and Circle services, injector uses the names and creates the instance using the provider. This is simplest way to resolve the dependencies but it breaks if minifiers or obfuscators are used as we know these changes the name of parameters based on there algorithm which later does not match with the providers. But if you are sure that minifiers/obfuscators are not going to be used on production then you can happily use this. Here we can see that we annotate $inject property of the function, here we provide the right name of the services in an array. In controller function we have chosen an arbitrary name (customCircle here) but code still runs fine. As provider names are assigned as values in the array, no minifier or obfuscator changes the values so it works perfectly fine. Here we can see that we create an inline array then we pass all the dependencies in the array and at end we pass the function where the dependencies need to be passed. Here function takes the input parameter which gets resolved to the dependencies based on the values passed in the inline array. We can pass all the services in similar way. This trick requires less code and easily understandable than the previous one. Here the key thing to be noted that it orderof the values in the array and parameter name is very important if that gets changed then the right dependencies be initialized to right parameters. Same holds true for second option as well. Hope you all have enjoyed this post including two earlier posts on dependency injection in AngularJS. Do share your feedback. 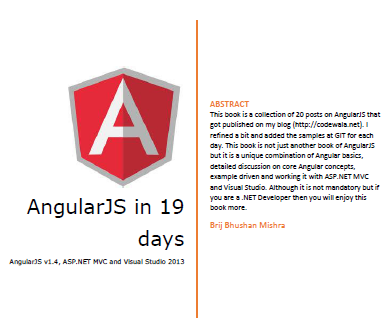 This entry was posted in AngularJS and tagged AngularJS, Annotation, Dependency Injection, DI. Bookmark the permalink.